Recently years have seen bamboo emerge as an increasingly popular flooring material that offers several advantages over traditional hardwoods. 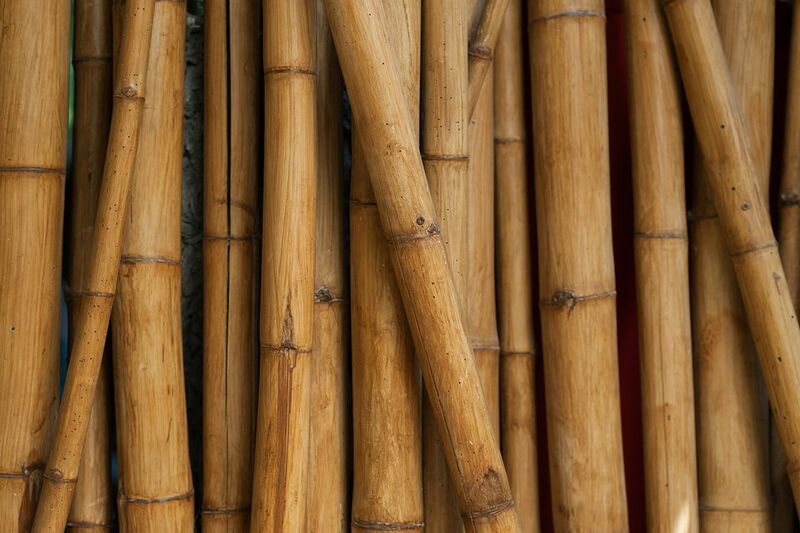 Bamboo is actually harder than many so-called hardwoods, yet it is not a wood at all. Bamboo is actually a type of grass, and as such it grows very quickly. Bamboo, therefore, is a completely renewable, sustainable source of material that can be used in place of maple, oak, and other hardwoods for applications such as plank flooring, and now, even cabinets and furniture. Bamboo is thus far only a very small segment of the kitchen and bath cabinet industry, but it is slowly growing in popularity as a replacement for traditional cabinet materials. The bamboo used in flooring and for the "wood" in cabinets and furniture is generally grown on plantation farms and is ready for harvest in three to five years after planting. After the top part of the plant, which may have reached a height of 50 to 65 feet, is harvested, the plant will the resprouts from the ground. Bamboo plants constantly renew themselves and can be harvested every three years or so, making this a truly sustainable product. This is in sharp contrast to hardwood lumber, which may require nearly 100 years for a tree to mature, and where harvesting kills the tree entirely. There are a number of manufacturing processes used to transform bamboo into lumber planks, and the same processes used for flooring planks are used for the lumber used in cabinetry and other furniture. Most typically, the long bamboo stems are cut into thin lengthwise slats which are then formed into long slats under heat and pressure. The slats are then glued up into planks or sheets, again under heat and pressure. These planks and sheets are then cut and sanded into building products that resemble traditional dimensional lumber and plywood sheets. The bamboo planks used for flooring resembles traditional hardwood flooring planks, while the sheet goods used for cabinet carcasses resembles traditional sheets of plywood. In both products, you can see the laminated layers of bamboo in the material itself. You can also often see the "nodes" of the original bamboo stalks in the material. For cabinetry work, there are both solid bamboo panels available (though they are expensive), as well as bamboo plywoods, in which a surface layer of bamboo is laminated over core plies of traditional wood. In another type of manufacturing process, there is no lamination of bamboo strips, but instead, the bamboo is crushed into a pulp of fibers, which is then shaped, glued, and compressed into planks and sheets. The appearance of strand-woven bamboo is quite different from laminated bamboo. Instead of distinct laminate layers being visible, strand-woven bamboo has a look of traditional wood lumber, with a grain-like look created by the interlocking strands of bamboo fibers. Strand-woven bamboo is considerably harder than laminated bamboo, which makes it a good choice for flooring applications. Bamboo cabinets come in a variety of finishes, sizes, and styles. Because bamboo is a very heavy building material, and it is also rather expensive. A 4 x 8-foot sheet of 3/4-inch thick of solid laminated bamboo can cost about $200. For this reason, bamboo cabinets usually use a traditional plywood or MDF carcass construction, with bamboo-laminated boards and sheet materials reserved for the exposed portions—the doors and drawer fronts. Where the sides of cabinets are exposed, such as on cabinet islands and peninsulas, they usually are made with thin bamboo veneer applied over an MDF or plywood cabinet wall. Natural blonde finishes tend to be the most popular option for bamboo cabinets, due to the lovely striated appearance of the material. Although darker stains tend to hide the attractive, unique look of bamboo, darker finishes are available if you need them in order to maintain cohesiveness with your home's current design. Because the demand for bamboo cabinets is still fairly low, you will find a limited but adequate range of cabinet sizes available. For example, leading bamboo cabinet supplier Mr. Bamboo offers nine base cabinets, seven upper wall cabinets, two pantries, and a wall oven cabinet in their product line. The largest base cabinet is 36 inches wide, 34 1/2 inches high, and 24 inches deep. The largest wall cabinet is 36 inches wide, 42 inches high, and 12 inches deep. Bamboo cabinets typically are available in slab-door (Euro-style) and Shaker-door styles with simple straight frames and panels. Bevels and raised panels are impossible with bamboo cabinets, due to limitations of the building materials. Bamboo cabinets are usually constructed with a type of bamboo "plywood" in which a surface veneer of bamboo is applied over traditional wood plywood. Shaping the panels would expose the wood plies below the surface veneer. BambooCabinets.com: Serving only the San Francisco, CA Bay area, with no online ordering possible. Canyon Creek Cabinet Company: This company sources their cabinets in multiple locations along the West Coast and in NY. Kitchen Craft Cabinetry: This NY-based company sources their hand-crafted cabinets to multiple locations in NY and NJ. Kitchen Cabinet Kings: This online cabinet resource is the perfect place to order and discover your new bamboo cabinets online. Omega Cabinetry: You can find where to purchase bamboo cabinets nationwide by using their simple location finder.